Gather Make Shelter from MetroEast on Vimeo. Listen to Joseph Gallivan's interview with Dana Lynn Louis HERE. Gather: Make: Shelter is a citywide creative collaboration which connects people experiencing houselessness and those more fortunate. The project bridges art making, skill building, and philanthropy through direct humanitarian engagement within our community. Over the past 8 months, Gather:Make:Shelter has been collaborating city-wide with local potters and people experiencing houselessness to create 500+ hand-painted bowls. These unique bowls will be available for sale at the celebration on September 23rd at Pioneer Courthouse Square, 12–4 pm. Proceeds will be contributed to getting people into housing. Gather: Make: Shelter is founded and organized by artist Dana Lynn Louis, who has created many major regional public artworks. Her travels in West Africa helped result in the construction of a cultural center, and other forms of aid for Mali residents as well as art collaborations with a women’s collective in Senegal. Echoing her work from abroad, Gather: Make: Shelter is a response to the current housing crisis in Portland. 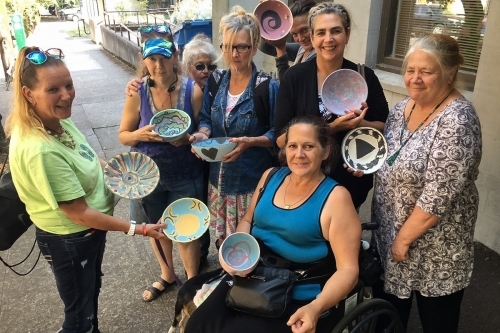 The project culminates in a celebratory public event where the hand-painted bowls will be available for sale and the money raised will be given to local organizations who support urgent housing needs for the upcoming winter. The September event will showcase bowls from 60 workshops led by Dana Lynn Louis. Bowls were made by local potters, and hand-painted by people currently experiencing houselessness who received a stipend for their participation. Amalie Roberts & Victory Project PDX, and Sisters of the Road are preparing food to be served at the September event. Entertainment includes poetry readings by StreetRoots Vendors and music by The Karen Lovely Band, Edna Vasquez, and The Maybelle Choir. Gather: Make: Shelter has the generous support of the Charitable Partnership Fund, a 501(c)(3), publicly supported, charitable organization. Other supporters include Central City Concern, Imani Center, Estate Hotel Mentor Program, Living Room, Letting Owings, P:ear, Janus Youth, Street Roots, Rose Haven, New Avenues for Youth, Maybelle Center, Right To Survive, HIV Day Center Ecumenical Ministries, Human Solutions, Oregon College of Art and Craft, Ash Street Studios, Pacific Northwest College Of Art, Mt. Hood Community College, Grant High School, Converge 45, Vibrant Table Group, Georgie’s Ceramic Supply, Amalie Roberts & Victory Project PDX, Grand Central Baking, Sizzle Pie, Blick Art Supply, Urban Gleaners, Cumbersome Multiples, as well as 40 independent potters and collectives.